Black Congressional Staffers walked off their jobs today for a “Black Lives Matter” protest. No white ally staffers were included in the photo. White allies were not included in the group shots. 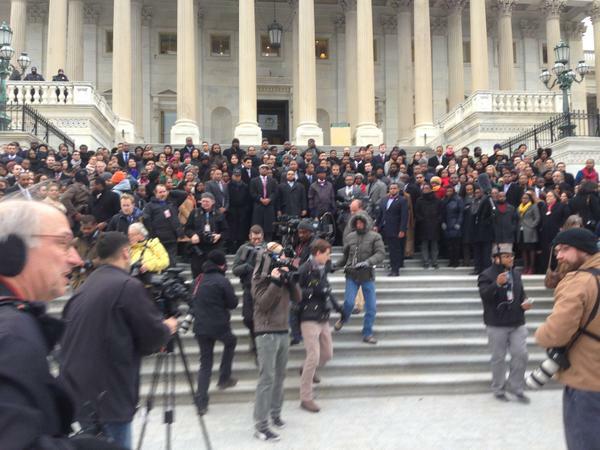 The Congressional Black Associates, Senate Black Legislative Staff Caucus, the Brooke-Revels Society, the Congressional African Staff Association, and the African American Women on the Hill Network—all dedicated to representing African American staffers on Capitol Hill—are helping to organize the protest as a “show of unity and solidarity… to stand shoulder to shoulder with other peaceful demonstrations. Only whites were not invited.